Udon Thani is an unremarkable place. It was the location of a US Air Force base during the Vietnam War, so many locals made money and learned English, making it a prosperous city Thai standards. The city has a large expat community but virtually no independent tourists. 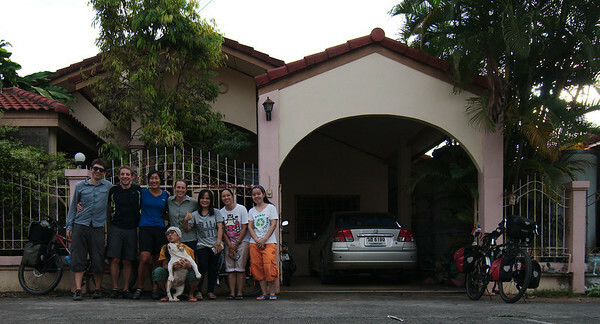 The only thing we did in Udon Thani, between changing bicycle wheels and mailing packages home, was eating. After having spent a month in Laos where the food was expensive and limited, we were pretty excited by the abundance of cheap, delicious food. So despite the lack of tourist attractions, our three days in the city were rather pleasant, albeit gluttonous. Our first day on Highway 12 was the toughest. We hadn't realised that for most of the day the highway ran through Nam Nao National Park, home to several wild elephants. We concluded, after riding over a lot of elephant poop, that these elephants must make regular appearances on the highway. The road, though beautiful, was virtually deserted and eerily quiet, making every rustling leaf a potential angry elephant. We felt vulnerable, especially at the speed we were going on the climbs. I spent the day constantly reevaluating our strategic position, how far were we from a downhill getaway? We could outpace an elephant on a downhill, but every downhill was followed immediately by an insane uphill. I pictured us trapped in a crevasse, between two climbs, surrounded by elephants. Other than our constant worrying about elephant attacks, the day's ride was uneventful, the highlight of which was getting Google street mapped (GPS coordinates: N16.76218°, E101.51997°) on this entirely empty stretch of highway! Continuing along Highway 12, we spent the next two days on the stretch of the road known as the Green Route. Apparently this title has made the area extremely popular. The road was empty on the previous day and all of a sudden the road widened and tons of Thai tourists appeared. The climbs were just as steep, but with lots of access to food and water and with no threat of wild elephants, the riding seemed a lot easier. 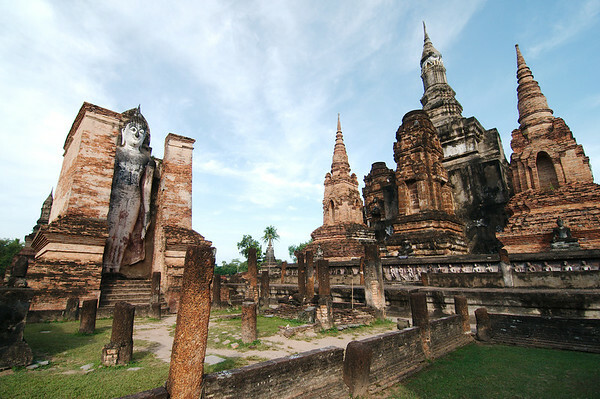 We took a nice long break in Sukhothai, where we joined the hundreds of other tourists visiting its historic old city on rental bicycles. 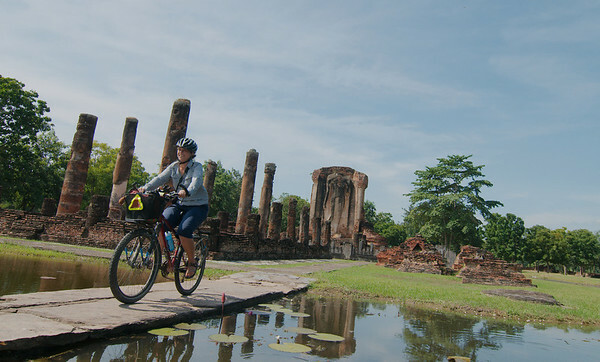 The bicycle is by far the most popular way to explore the temples and it makes for a really pleasant, uncrowded atmosphere. At some of the more remote temples we were the only people there. Our ride from Sukhothai to the border stretched from our planned two days into five days when Yann got pretty sick fifty kilometres from our destination. We were on our final day of riding, just a few dozen metres short of the first of two passes for the day when we pulled over at a roadside market to rest. 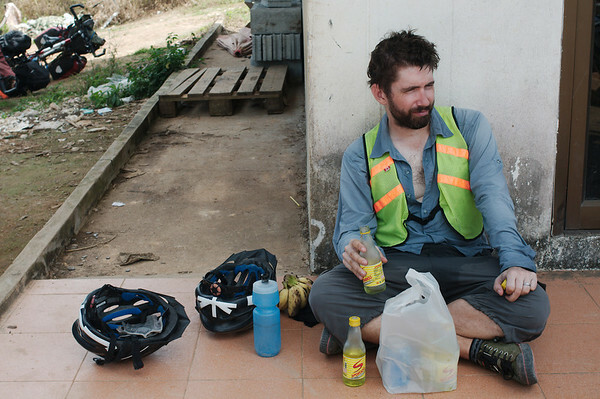 Yann lay on the pavement for over an hour, consumed several electrolyte drinks but was completely out. There was no way he was going to make it up another climb. We turned back down the road where we had spotted a small agro-tourism resort on the side of the mountain. It was a pretty nice place to be stuck, the weather was mercifully cool as Yann battled a fever for two days. 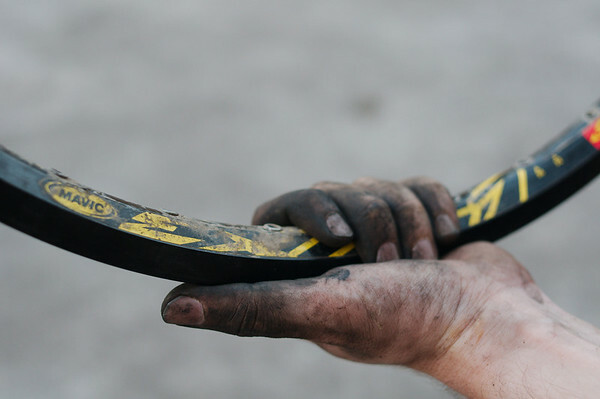 I walked up to the market every day to buy our meals and emptied the few shops of their electrolyte drinks. After three nights Yann wasn't entirely better but he was feeling strong enough to leave. 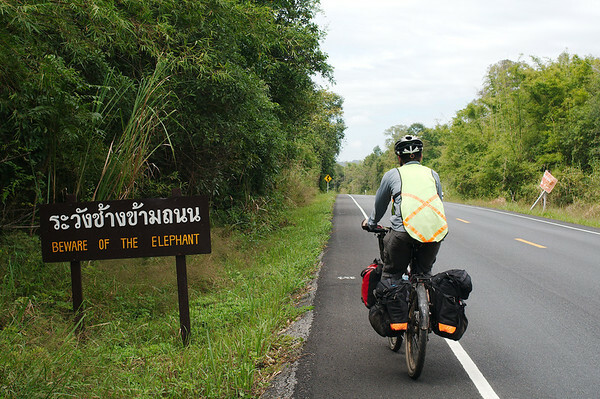 A few kilometres out of Mae Sot we spotted another cyclist coming from the other direction, or rather he spotted us. On a fully-loaded touring bike, we thought he was a tourist, but he was actually a local cycling enthusiast coming to meet us! After receiving a call from a friend who spotted us on the road, he had rode out to intercept us. After brief introductions we were instructed to follow him to his place where he showed us to our own room in his home. Our host, Yun, then led us around town. First treating us to two plates each of noodles for lunch, then bringing us to his shop at the border market where we we met his wife and daughter. On the way to the market, we picked up two American cyclists who had just arrived in town and were looking for a place to stay. There were now five of us, parading around town with our touring bikes. Yun and his family exhibited much of the same traits as our past cycling hosts: boundless energy and incredible generosity. We were fed and lodged and when we woke up at 5am the next morning, we found that everyone was already awake preparing a hearty breakfast for our send-off, including cheese and an assortment of speciality coffees! We were made to promise that we would visit again on our return from Myanmar, this wasn't a particularly difficult promise to make. ChrisR here. Been following your travels on-and-off across the semester, and now that the exams are over I thought I'd check in and see how two favorite bike-powered mathematicians are doing. You crazy beautiful people. What a fantastic journey you're having! (Yann's recent bout of unspecified sick not withstanding) it is great to hear you are doing well, and are meeting such amazing and generous people wherever you go. If nothing else, you two are certainly remaining ridiculously photogenic! Happy travels and safe returns! PS: You guys are missing out on an absurd amount of snow here. You are great fellows, you went this way only by bicycles! 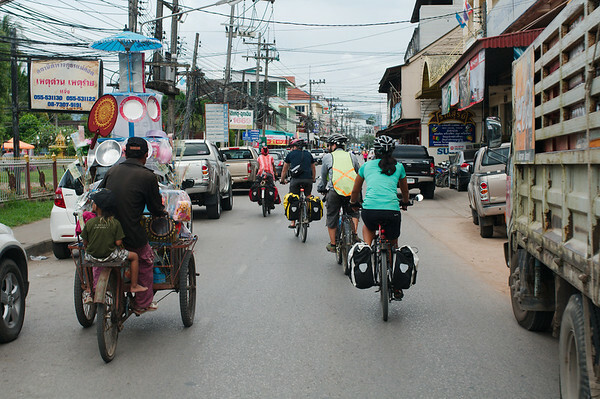 During my trip to Chiang Mai, I thought between renting a bicycle and a motorcycle. I chose motocycle http://catmotors.net/chiang-rai-loop/, because I could see more places, for a short period of time, with this. I spent two beautifull weeks in Thailand. Although your way was also no less interesting and unusuall.